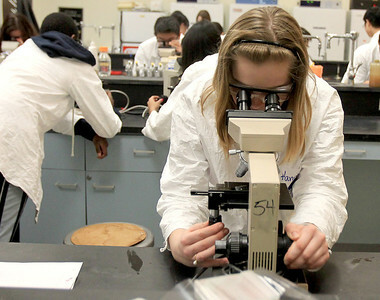 Sandy Bressner - sbressner@shawmedia.com Hannah Swerbenski, 15, of Crystal Lake looks through a microscope during her microbes and disease class at the Illinois Math and Science Academy in Aurora. Sandy Bressner - sbressner@shawmedia.com Hannah Swerbenski, 15, of Crystal Lake works with classmate Uriel Ramirez, 17, during her microbes and disease class at the Illinois Math and Science Academy in Aurora. Hannah Swerbenski, 15, of Crystal Lake works with classmate Uriel Ramirez, 17, during her microbes and disease class at the Illinois Math and Science Academy in Aurora.